A young man sits at a grand piano. His eyes are closed, his hands, at the center of the keyboard, are in the middle of playing. He is highly focused. His profile, his ear, his hands, physique are all very fine, the skin deathly pale. 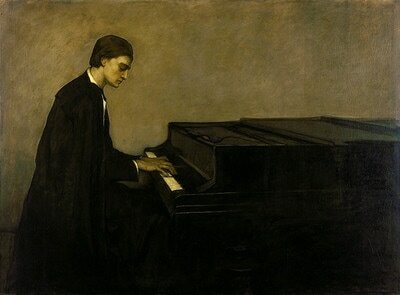 The androgynous pianist is portrayed before a beige-gray, monochrome ground in profile. The line of his back is optically lengthened by his cape. Severe, ebony contours lift the seated pianist into the image foreground, and lend him dramatic autonomy. The smooth surface of the piano is noticeable due to the reflections and light reflexes on its top, towards the bottom it becomes a vivid, inky expanse. The realism of the instrument and the pianist is only spelled out in as much detail as necessary. The reduced, abstract expanses are painted in a vivid style. 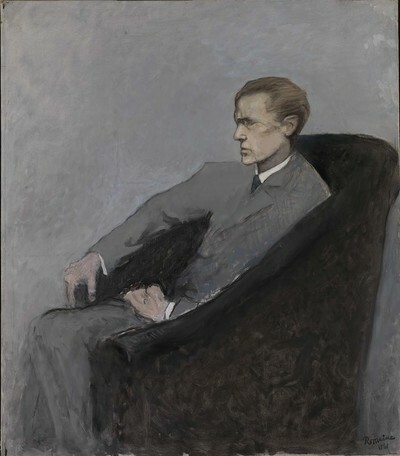 The sitter wears a perfectly fitted black suit with a white shirt and has a type of cape thrown over his shoulders. Black fabric is draped over the piano stool, falling in folds. All of the clothing items are menswear that befit the sitter’s rank. The figure and the actually monstrous instrument are unified by their color. Like a dark frozen wave, its swell beginning with the pianist’s back and breaking out of the right side of the picture. The musician is shown in a heroic moment of great sincerity and concentration. She is completely introspective, creating and hearing music simultaneously. A female dandy. The figure of the dandy, an extravagant variety of gentleman, is characterized by elegance, perfect manners and ambiguous sexuality. The dandy is also a master of performative role-playing with bourgeois conventions and concepts of class. As a conscious performer of identity (including the knowledge of own limitations), the dandy has represented a modernistic type of person since the 19th century. He is a culturally potent figure, distanced from himself. Renata Borgatti, who was the painter’s lover for a short time on the island Capri, is portrayed in this painting as an impressive author-pianist, embodying depth and intellectualism. Romaine Brooks called her pictures from 1920 on portraits of modern women, and always gave them titles that identified the figures, who usually had a masculine demeanor, as women, for instance her famous portrait of the painter Hanna Glucksmann Peter (A Young English Girl) from 1923-1924. A young woman sits in an armchair facing 8 o’clock from the viewer’s perspective. She is in profile, looking out to the left side of the picture. A horizontal black stripe of paint behind her highlights her pale face. To the right edge of the painting, a cut-off “leg” implies that the piece of furniture in the background must be a piano. The veil, lifted back, is in line with her status, and it curves up, blackish-brown, above the edge of the piano, and cascades down her back. Despite the achromatic, reduced colors of the painting, the face of the sitter seems vivid and clear. The white flowers, cultivated nature and iconographic heralds of innocence, are the frontmost and also the lightest part of the picture. The figure is sitting up very straight on the upholstery, still wearing her voluminous coat. Her stillness highlights the fact that she has just arrived, or is about to leave. Romaine Brooks also painted a situation of heightened attentivity and focus here: listening to music. The girl’s ear, the organ which the music enters, is the point of the image that our gaze is drawn to and stays. Since the figure is looking out of the image to the left, and parallel image axes are predominant, the focal point is to the left above the center of the picture (instead of to the right, as usual). We can feel the anatomy in detail, sense every bone, and also see her small earring. “Lady at the piano” is a common trope of interior painting around the turn of the century. The piano as a symbol of economic prosperity and an attribute of higher education turned the player herself into a status symbol. The location of the piano, usually a bourgeois salon, represented the interface towards the outside world within a private environment, so it accordingly it served as a space of representation. 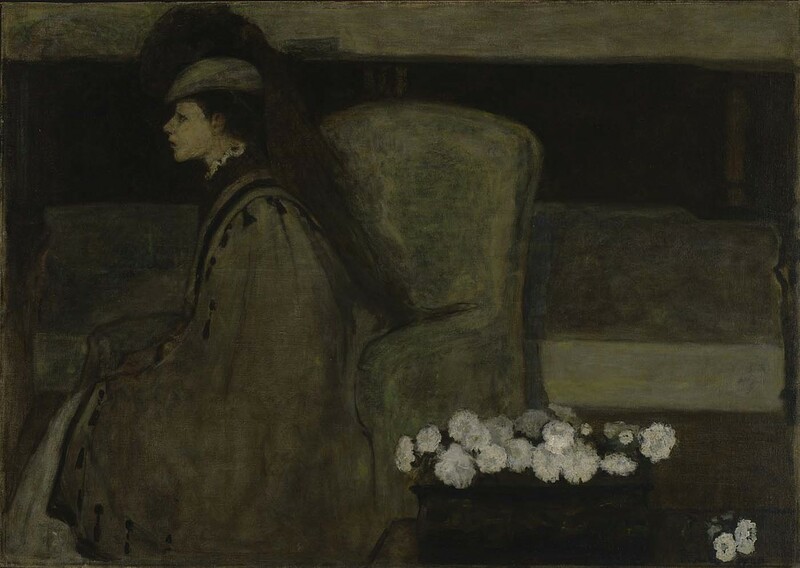 Unlike James McNeill Whistler, who paints a pianist in a similar composition in 1859, in a detailed, domestic and bourgeois scene, and gives her a child listener, Romaine Brooks almost completely eschews the addition of symbolical attributes. 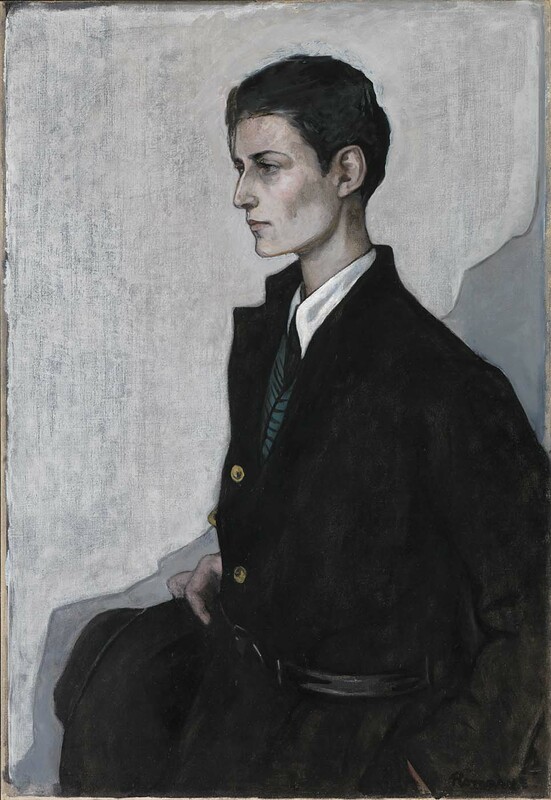 Although the painting from 1910 fulfills the conventions of interior painting and genre painting, what we see here is a strong individual, occupied with an intellectual activity, as is so often the case with Romaine Brooks. The young listener is completely and fully the subject of her surroundings. 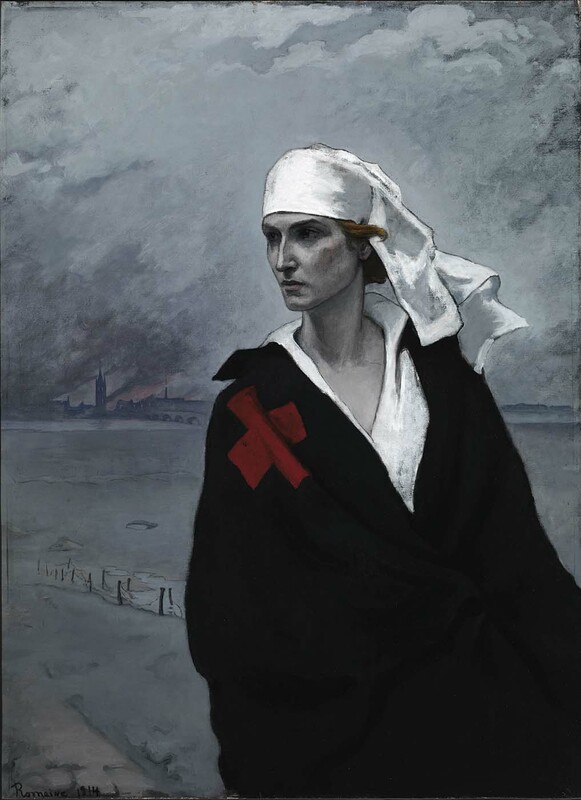 In the two pictures, painted 10 years apart, Romaine Brooks illustrates the experience of music wonderfully through her two protagonists. In 1995, at the age of 20, I attended the course “Training Comparative Seeing for Beginners with Originals” at the Free University of Berlin. Almost exclusively young women viewed and described paintings by men at the public collections on Berlin’s Museum Island, under the guidance of an art history professor who was mellow with age. It was terrible and great at the same time. After the first shock over the ritual of the formalist approach and my new, stuffily academic surroundings, I found my way from seeing to recognizing. Speechlessness and then finding words, the norms of liberal arts language, the corset of form-based visual comparison were an instructive lesson in visual thinking and description. During these collective sessions of viewing art, which were free from biographical, historical or class-related anecdotes (after all, the canonization was to occur via the comparative formation of style), I saw and felt very clearly, for the first time, that something was wrong with the gender ratio of all participants involved, including the protagonists of the paintings. I only recognized the full scope of my academic “primal scene” much later. Ein junger Mann sitzt an einem Flügel. Seine Augen sind geschlossen, die Hände, im Zentrum der Tastatur, befinden sich mitten im Spiel. Er ist hochkonzentriert. Sein Profil, sein Ohr, seine Hände, der Körperbau, alles sehr fein, die Haut leichenblass. Der androgyne Pianist ist vor einem beige-grauen, monochromen Hintergrund in Seitenansicht dargestellt. Die Rückenlinie ist durch den Umhang künstlich verlängert. Massive, tiefschwarze Außenlinien heben den Sitzenden in den Bildvordergrund und geben ihm eine dramatische Autonomie. Die glatte Materialität des Flügels ist durch Spiegelungen und Lichtreflexe an der Oberseite spürbar, zum Boden hin wird er zu einer lebendigen, tiefschwarzen Fläche. Der Realismus des Instruments und des Pianisten ist so weit ausformuliert wie nötig. Die reduzierteren, abstrakten Flächen sind in einem lebendigen Duktus gemalt. Der Porträtierte trägt einen perfekt sitzenden, schwarzen Anzug mit weißem Hemd und hat über die Schultern eine Art Cape geworfen. Über den Klavierhocker ist ein schwarzer, in Falten fallender Stoff drapiert. Bei allen Kleidungsstücken handelt es sich um standesgemäße Herrenkleidung. Die Figur und das eigentlich monströse Instrument bilden durch ihre Farbigkeit eine Einheit. Wie eine dunkle, gefrorene Welle, deren Woge mit dem Rücken beginnt und nach rechts aus dem Bild herausbricht. Die Musikerin ist hier in einem heroischen Moment von grosser Ernsthaftigkeit und Konzentration zu sehen. Sie ist ganz nach innen gerichtet, erzeugt und hört die Musik gleichzeitig. Ein weiblicher Dandy. Die Figur des Dandy, eine extravagante Spielart des Gentleman, zeichnet sich durch Eleganz, perfekte Manieren und eine uneindeutige Geschlechtlichkeit aus. Auch das performative Spiel mit bürgerlichen Konventionen und Klassenvorstellungen beherrscht er. Als bewusster Performer von Identität (inklusive des Wissens um die eigenen Limitierungen) stellt der Dandy schon seit dem 19. Jahrhundert einen modernistischen Menschentypus dar. Er ist eine kulturell potente Figur, mit Distanz zu sich selbst. Renata Borgatti, die für kurze Zeit die Geliebte der Malerin auf der Insel Capri war, ist in diesem Gemälde als beeindruckende Autoren-Pianistin dargestellt, die Tiefe und Intellektualität verkörpert. 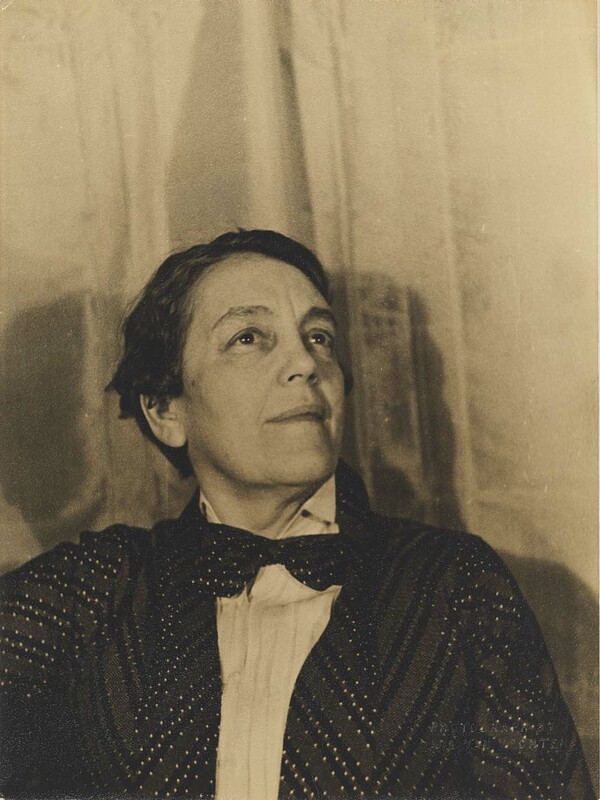 Romaine Brooks selbst bezeichnete ihre Bildnisse ab 1920 als Portraits moderner Frauen und gab ihnen stets Titel, welche die zumeist maskulin inszenierten Personen des wirklichen Lebens eindeutig als Frauen identifizierten, wie ihr berühmtes Porträt von der Malerin Hanna Glucksmann Peter (A Young English Girl) von 1923-1924. Eine junge Frau sitzt auf einem dem Betrachter in 8 - Uhr - Position zugewandten Sessel. Sie schaut im Profil nach links aus dem Bild heraus. Ein horizontal verlaufender, schwarzer Farbbalken im Bildhintergrund betont ihr helles Antlitz. Rechts am Bildrand verweist ein angeschnittenes „Bein“ darauf, dass es sich bei dem Möbel im Hintergrund um ein Klavier handelt. Der zurückgeworfene Schleier ihrer ganz ihrem Status entsprechenden Kopfbekleidung bricht über dem Flügel aus in ein braun schwarzes Rund, das entlang dem Rücken weiter ausufert. Trotz der unbunten, reduzierten Farben des Gemäldes erscheint das Gesicht der Dargestellten lebendig und klar. Ein Arrangement aus Azaleen rechts im Bildvordergrund bettet sie in die mittlere Ebene des Bildraumes ein. Die weissen Blumen, kultivierte Natur und ikonographische Boten der Unschuld sind der vordergründigste aber auch der hellste Bereich des Bildes. Die Figur sitzt sehr gerade in Körperspannung auf dem gepolsterten Möbel. Sie schaut ernst und konzentriert und trägt noch ihren voluminösen Mantel. Dass sie gerade erst angekommen ist oder bald wieder fortgehen wird, betont ihr jetziges Innehalten. Romaine Brooks hat auch in dieser Interieurszene einen Moment grösster Zugewandtheit und Konzentration gemalt: Den des Musikhörens. Das Ohr des Mädchens, das Organ in welches die Musik eindringt, ist der Punkt, an dem sich unser Blick verdichtet und haften bleibt. Da die Dargestellte links aus dem Bild schaut, und parallele Bildachsen vorherrschen, ist der Fokus des Betrachters diesmal links oberhalb der Bildmitte (nicht wie sonst oben rechts). Wir spüren ganz genau die Anatomie, ahnen jeden Knochen und sehen auch den kleinen Ohrring. »Die Frau am Klavier« ist ein gängiges Motiv in der Interieurmalerei um die Jahrhundertwende. Das Klavier als Symbol wirtschaftlicher Prosperität und als Attribut höherer Bildung machte auch gleich die musizierende Person zum Statussymbol. Der Klavierstandort, in der Regel der bürgerliche Salon, stellte im privaten Umfeld die Verbindung zur Außenwelt her und diente dementsprechend als Raum der Repräsentation. Anders als James McNeill Whistler, der in einer ähnlichen Komposition von 1859 eine Pianistin in einer detailreichen, häuslichen, bürgerlichen Umgebung zeigt und ihr eine kindliche Zuhörerin zur Seite stellt, verzichtet Romaine Brooks fast gänzlich auf die Zugabe von symbolischen Attributen. Auch wenn das Gemälde von 1910 die Konventionen sowohl der Malereigattung Interieur als auch der Genremalerei erfüllt, betrachten wir hier wie so oft in Romaine Brooks Bildnissen in erster Linie ein starkes Individuum bei einer geistigen Tätigkeit. Die junge Zuhörerin ist ganz und gar das Subjekt ihrer Umgebung. Romaine Brooks stellt in beiden, im Abstand von 10 Jahren entstandenen Gemälden anhand ihrer Protagonistinnen auf wunderbare Weise die Erfahrung von Musik dar. 1995, im Alter von 20 Jahren, besuchte ich die Veranstaltung „Übung im vergleichenden Sehen für Anfänger vor Originalen“ der Freien Universität Berlin. Fast ausschliesslich junge Frauen betrachteten und beschrieben unter Anleitung eines altersmilden Professors der Kunstgeschichte Gemälde von Männern in den Staatlichen Sammlungen auf der Berliner Museumsinsel. Es war schrecklich und grossartig zugleich. Nach dem ersten Schock über das Ritual der formalistischen Annäherung und meine neue, bieder - akademische Umgebung, gelangte ich vom Sehen zum Erkennen. Keine Worte und dann Worte finden, die Normen der geisteswissenschaftlichen Sprache, das Korsett des formbasierten visuellen Vergleichs waren eine lehrreiche Lektion im visuellen Denken und im (Be -)Schreiben. Bei diesen kollektiven Bildbetrachtungen, die frei von biografischen, historischen oder klassenrelevanten Anekdoten waren (schliesslich sollte die Kanonisierung über die vergleichende Stilbildung funktionieren), sah und spürte ich jedenfalls das erste Mal sehr deutlich, dass etwas nicht stimmte am Geschlechterverhältnis aller Beteiligten, die Akteure auf den Gemälden eingeschlossen. Erkannt habe ich die Tragweite meiner akademischen „Urszene“ erst viel später.